Aloha! This stunning Waikoloa Beach Villa is surrounded by the sights, sounds and feel of a tropical resort and features two bedrooms, two full bathrooms and accommodates up to six guests. Every guest can sit back and enjoy their time together in this magnificent home. 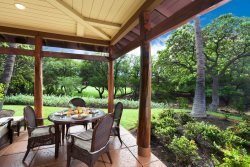 Casual barbeque meals on the dining lanai are the perfect way to take in the golf course views. Indoors, the living room is full of verve and sunshine and features comfortable furnishings, a large flat screen TV, and sliding glass doors that open onto the lanai. The fully-stocked kitchen is open and inviting with a large breakfast bar that seats three, and a dining area that seats four. Indoors or out, there is plenty of space for everyone to relax, reconnect and have fun. This master en suite is more than just a place to lay your heads; this spacious feeling room offers a cozy king-sized bed, a flat screen TV, and natural lighting. The master bath has subtle lighting that creates a romantic mood which is all a couple needs to rekindle the flame. The guest bedroom is within close proximity to the main bathroom and offers a full-sized bed. For additional guests there is a sofa sleeper in the living room. Also included in your unit is; air conditioning & ceiling fans, washer/dryer, complementary parking and complimentary WiFi. Unfortunately, we do not allow pets. All units have informative guidebooks to help you get the most out of your stay. You’re only a short walk to the two swimming pools, two hot tubs and fitness center, and A-Bay Beach is a short 15-minute walk and a beautiful setting for snorkeling, swimming and sunsets! Located across the street is Queens' Market Place and next door is The Kings' Shops, complete with food court, art galleries, sushi, creamery ice cream, Macaroni Grill, Island Gourmet Market, Starbucks, and many other shops, daily local entertainment, classes and cultural events. Further down the road (10 to 15 minute drive) are other local beaches, whether you want the pristine white sands of Hapuna Beach, or the rocks, trees, and safe entry spots of nearby "Beach 69" (at mile marker 69).